This tumbling mat adds functionality by providing a white practice beam stripe on one side as well as hand/foot cartwheel guides on the other. Red on hand/foot side & royal blue on beam side. Our mats do not contain lead and have recently passed testing requirements enacted by the Consumer Protection Safety Improvement Act of 2008.As all of our gymnastic and tumbling mats, the Cartwheel Beam Mat designed and crafted to our demanding standards and boasts a rugged 18 oz. vinyl cover filled with 5/8 foam. PARENT TIP: This mat helps beginner tumblers learn proper hand placement for the cartwheel. Go one direction for left handed and the other for right handed. 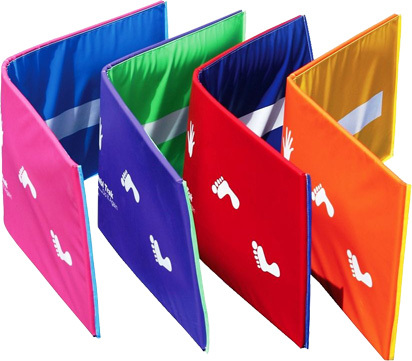 All colors (except Red/Royal Blue) will have a lead time of approximately 3-5 weeks to ship.